The Wall Street Journal ran an article on Monday implying that professional investment managers, who try to beat the market through stock picking and market timing, are poised to reverse a persistent trend of underperformance. Their proof? In the first three months of 2017, the percentage of outperforming managers is on the rise, from just 30% in 2016 all the way up to 45% so far this year. 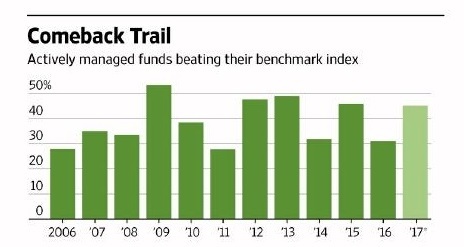 Another way to say that is in a "good" year for active management, we still see 55% (more than half) of professionals failing to produce returns available from simply buying an index. If the pros can’t pick stocks or time their entry and exit from the markets consistently enough to outperform, what are the odds that you can?